Johann Sebastian Bach is one of the most famous composers from the Baroque period. If he was still alive today, he’d be 333 years old. So, let’s celebrate 3 of his most famous works with a 33x33 loop puzzle within a 3x3 metagrid of 3+3 different genres! Masyu: On a white pearl the loop goes straight but turns on at least one side. On a black pearl the loop turns but goes straight on both sides. Balance Loop: On a white pearl the loop goes straight and extends out the same distance either side. On a black pearl the loop goes straight but extends out different distances from either side. Inside-Outside/Every Third Breakpoint: On a white pearl the loop turns so that more of the cell is outside of the loop than inside. On a black pearl the loop turns so that more of the cell is inside of the loop than outside. 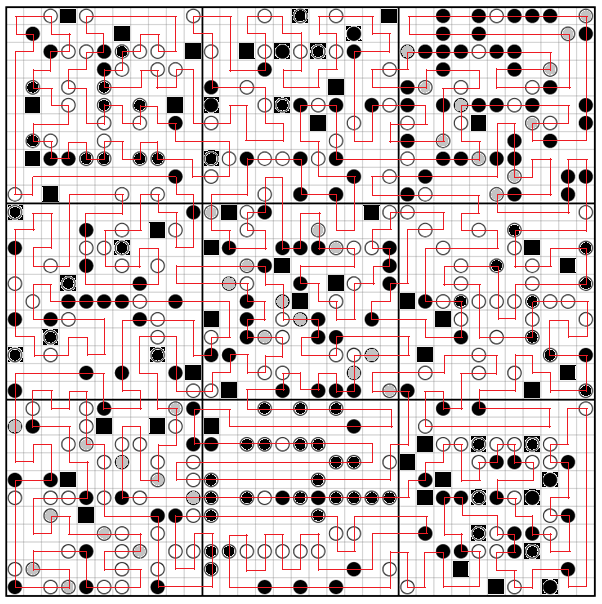 Additionally, regardless of all other rules, if the loop is cut into ‘segments’ at each pearl it passes through, any segment which has any part in a region where this is applicable (even if it is only half a cell-width long) either: a) is exactly one cell-width long; or b) turns exactly twice. Yajilin: Draw a loop connecting cell centres of some pairs of adjacent cells. Shade any cell the loop does not pass through black. Then no two black cells may be orthogonally adjacent. Deformation: Any white pearl may be shaded black and function as a black pearl (this does not count as a shaded cell for the purposes of the Yajilin global rule). All pearls in these regions must be passed through. Optional: Any pearl may not be passed through, however as in the Yajilin global rule the cell containing the pearl must be shaded black and not be adjacent to any other cell which is also shaded black. Grey: To make 3 colours, a grey pearl is a pearl which does not satisfy the requirements for being either black or white for its genre. Exactly one pearl in each row and column must be turned grey. All pearls in these regions (including grey pearls) must be passed through. Note that this rule does not change the Every Third Breakpoint base genre requirement – grey pearls act the same as white and black pearls in this regard. 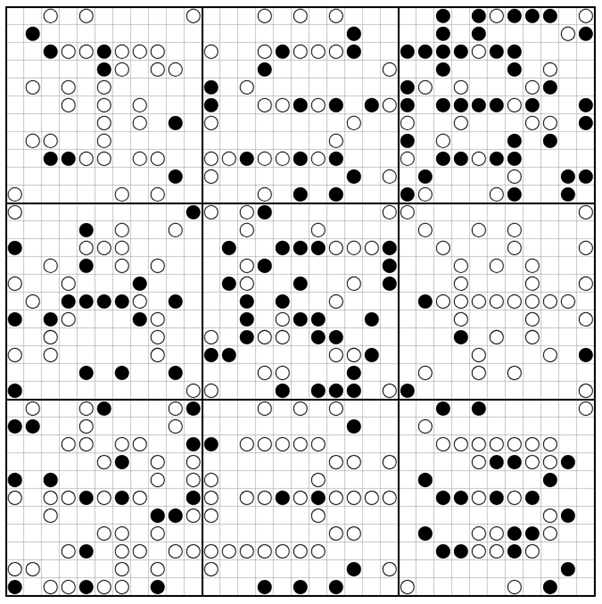 Graeco-Latin Square: In the 3x3 metagrid, each of the 3 base genres and each of the 3 deceptions appears exactly once in each row and column, with exactly one base genre and deception per square. Furthermore, each base genre-deception pair occurs exactly once. The Yajilin global rule always applies. Sorry for any factual inaccuracies. Thanks to @edderiofer and a non-user for testsolving! Inspired by The Ludicrous Loop: over a thousand cells of circular logic! - if you haven't tried this you should try it too! For solving the loop, the grids with the Deformation deception proved to be the hardest, at least for me, but all in all it's a great puzzle! Not the answer you're looking for? Browse other questions tagged logical-deduction grid-deduction seasonal or ask your own question.